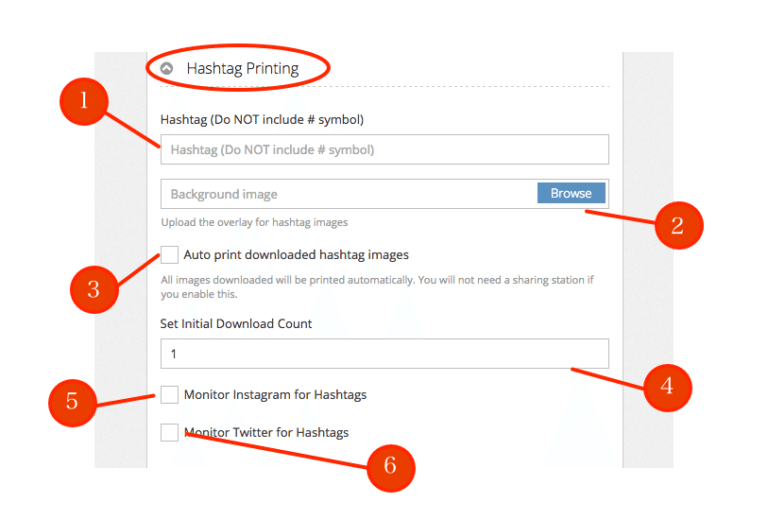 Learn how to setup Hashtag Printing in your event settings and apply a unique overlay to the images retrieved from your hashtag. The Hashtag Printer feature within PicPic Social allows you to download images from Instagram & Twitter as soon as a guest has post them using your specified hashtag. The Instagram & Twitter images can be placed onto 4×6 sheets where they can be printed using any printer connected to the PC. Hashtag - Please enter your hashtag without using the actual # symbol. It is recommended that you choose a hashtag that is as unique as possible. Auto Print - Enable to print the images immediately. Initial Count - If there are already images that exist on Instagram using this hashtag, PicPic Social will only download the last X number of photos posted to Instagram. If you set this to 5, the software will download the last 5 photos posted to Instagram under the hashtag. Click this check box if you would like to enable Instagram to be monitored for new images under the designated hashtag. Click this check box if you would like to enable Twitter to be monitored for new images under the designated hashtag. Once complete scroll to the bottom of the settings page and press UPDATE/CREATE EVENT to save your settings. 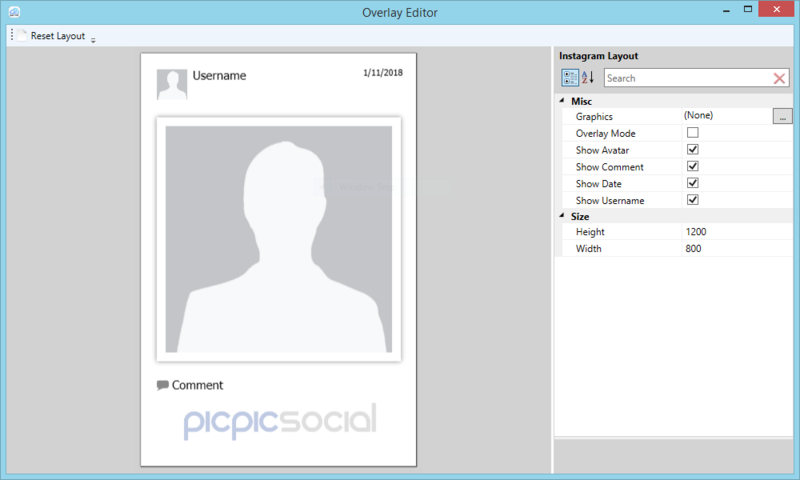 You are now ready for the PicPic Social Device Server. This is required for you to run the Hashtag Printer. IMPORTANT NOTE: If you aren't familiar with the PicPic Social Device Seraspect of PicPic Social you can learn how to install and properly configure it here. Launch the Device Server and select the event that you enabled the Hashtag Printer settings for. Press Start on the Device Server and you will be prompted to log into your Instagram/Twitter account. Please do so and begin printing images from your designated hashtag. 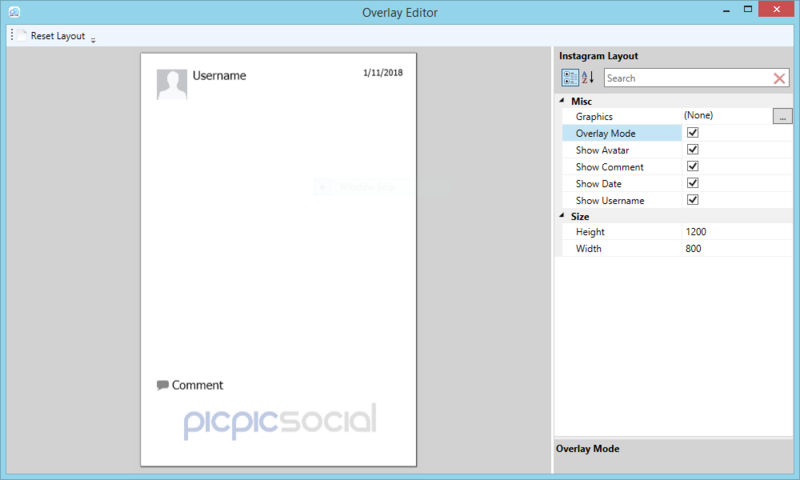 Unlike other features to adjust the hashtag printing overlay settings, it requires for you to utilize the visual editor found on the PicPic Social Device Server. The visual editor lets you customize how your printed hashtag images will look. You can use the editor to hide and show some elements of the printed images and also change your photo's orientation. Show Date - Will show the date the photo was uploaded to social media. Show Username - Will show the username of the user that posted to social media. When you enable the Overlay Mode check box it removes the avatar out of sight if you want to view and customize the overlay only. Location - Set the location of the avatar/Instagram Image by using the left and top options. Misc. - Border color, width of border & the option to display shadow around the avatar/Instagram Image. Rotation - You can rotate the avatar/Instagram Image. 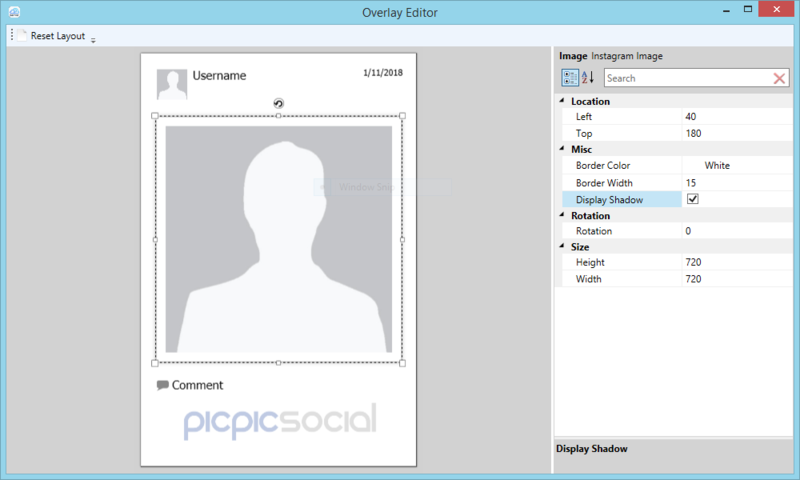 Size - This field allows you to adjust the height & width of the avatar/Instagram Image.